Producing Les Misérables would be challenging even with a professional company. So MYCO’s decision to perform the School Edition with a cast of 53 young actors between 12 and 18 years old might seem ambitious, but the resulting show is a triumph: a finessed and highly professional show that carried its audience through a wave of emotions and a story spanning twenty years. Dramatic from the first few bars, the show opens on a chorus of prisoners serving time on the day when one of them, Jean Valjean, is released. He determines to carve out an honest life for himself, but cannot escape the past as his old prison guard Javert tracks him down, equally determined to bring him to justice. Arran Johnson as Jean Valjean gave a very believable and endearing performance; powerful and gentle at once with a strong moral compass. He won the audience’s respect and affection easily. He also sung unfalteringly through the many octaves demanded of this part, quite a feat in itself. Chris Schweppe gave a stunning and unforgettable performance as Javert, Valjean’s formidable rival, with strong consistent characterisation and an equally characterful voice. His singing was brilliant – he seemed really at ease all the time, sung to suit his character, was quick-tongued over quick-paced lyrics and tackled recitative confidently. As the play progressed, he triumphed in portraying the internal conflict Javert faces, constricted by his concrete beliefs and inescapably bound to his one life ambition of hunting down his enemy. Anna Morgan’s portrayal of Fantine was absolutely heartbreaking, a tragic heroine and a strong victim. Her emotive and versatile voice expressed both defiant strength and trembling vulnerability. The taunting, chilling ensembles “At the End of the Day” and “Lovely Ladies” were dramatically staged with really strong choruses that sent shivers down the spine. One defining feature of this production was its excellent ensemble work. “Master of the House” was another rumbustious ensemble piece, with plenty going on onstage and lovely rowdy singing from the whole chorus, as suits a tavern! The Thénardiers were a fabulous double-act with delicious attitude and nerve. Johnny Allison as Thénardier, the pick-pocketing petty-crook landlord, made a quirky comic relief from the story’s usual relentless pace, and was a master of movement and accent. His wife (Theodora Laird) was sassy and lippy and deliciously blunt. Cosette’s first appearance was as a child, played by Ellis Lovett whose sweet simple voice held echoes of her future self in its tones and melody, and in its optimism. Anya de Villiers, as the grown-up Cosette, had a bright sharp voice full of hope and trust, which hit each soaring note. Her duet with Marius was very beautiful. Jake Halsey Jones’s youthful portrayal of Marius characterised him as a gentle, slightly naïve idealist, playing his emotions subtly. Eponine was played by Ruby Crepin-Glyne with real emotional honesty. Her voice (after she was saved from a microphone malfunction) was really rich – full of depth, longing and internal conflict. The revolution was amazing to watch, featuring more excellent and rousing chorus work. Performed with conviction by Shakur Gabbidon-Williams, Enjolras’ rallying cries stirred the blood and inspired courage in everyone present. Twelve year old Dan North played the young but determined Gavroche with attitude, and won over every heart. During the second act, the play became more intensely atmospheric with stark lighting, smoke, gunshots and a barricade that stretched the length of the stage. Clever design of the space also allowed for other similarly amazing transformations, with the unusual triangular shape of the stage inspiring atypical, striking blocking and choreography, especially during ensemble work. The revolving stage also helped to represent the passing of time and the characters’ movement through space. Despite a few first-night technical glitches, this show is a real success that promises only to improve further as the week progresses. With powerful music, strong principals and some outstanding chorus work, it well-deserves last night’s standing ovation and its sell-out ticket sales. MYCO’s recent production of Les Misérables School Edition prompted the kind of applause that you would normally expect in a West End theatre. That these youngsters — aged between 12 and 18 — should trigger such an enthusiastic reaction says a lot about their incredible talent, energy and commitment, which was brilliantly sustained throughout. For me, the highlights of this production were the ensemble numbers, in which the cast displayed a wonderful rapport as they belted out powerfully stirring numbers such as “Do You Hear the People Sing?” and “One Day More”, the striking, tableau-style groupings adding an extra layer of intensity and making for many a spine-tingling moment. The principal performers were outstanding. Arran Johnson gave a commanding performance, both vocally and dramatically, as Valjean, the ex-convict who is desperate to live a blameless life but who can never quite escape the shadow of his former existence. His nemesis, former prison guard Javert, was brilliantly handled by Chris Schweppe, who managed to capture the different sides to this complex character, while Jake Halsey-Jones gave a well-sung, appealing and sympathetic portrayal of the love-struck Marius. Anna Morgan, Ruby Crepin-Glyne and Anya de Villiers tugged on the heartstrings as Fantine, Eponine and Cosette respectively, all three singing with immense purity and beauty. 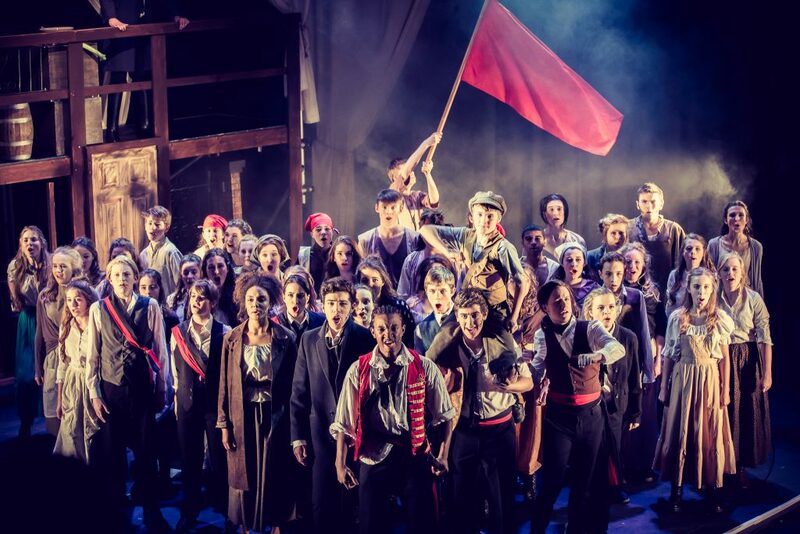 Among the students, Shakur Gabbidon-Williams was an imposing presence as the flag-waving Enjolras, and 12-year-old Dan North was a loveable Gavroche. Johnny Allison and Theodora Laird, as the Thénardiers, injected some much-needed light relief into the proceedings with their cheeky rendition of Master of the House, the former deliciously malevolent as he boasted about his crooked ways and the latter gloriously coarse as she bemoaned her lot in finishing up with such an unprepossessing husband. The ensemble, once again, impressed with some wonderfully boisterous singing.